By the pricking of my thumbs, something wicked this way comes. 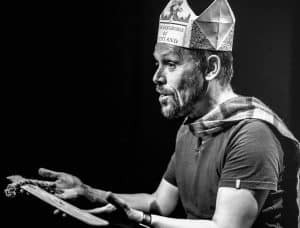 Andy Cannon, one of Scotland’s finest storytellers, takes audiences on a thousand-year journey from fact to fiction and back again in his retelling of Shakespeare’s classic tale. This inventive and clever one-man show is artfully tailored to a young audience. This captivating, age-old story is expertly told by Andy Cannon in an easy-to-follow, accessible way that appeals to audiences both young and old. The perfect introduction to Shakespeare and a wickedly funny ride you won’t soon forget! Watch the video below! Andy Cannon is a man with storytelling in his blood; a performer who can take the trickiest, most complicated of narratives and deliver it to a young audience as if it were a simple nursery rhyme…. Do yourself a favour and go and see this brilliant version of Macbeth. I went with two children 10 and 12 and an 83 year old grandpa and we were utterly transfixed by the wit, charm and clever telling of this great play. What a joy to watch storytelling like this – thank you!